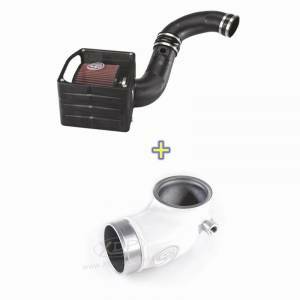 Increase performance, improve air filtration, and save a few bucks with an S&B performance cold air intake and intake elbow combos. S&B Intake Elbows significantly improve the airflow after the intercooler, and cast aluminum elbows increase airflow 55.3% more than stock. The result is cooler, denser air delivering more power and better fuel economy. Elbows feature CNC-tapped NPT ports (to install gauge or power adders) and O-ring seals for leak-free operation. For great "bang-for-the-buck" power gains, combine S&B Intake Elbows with their cold air kit to reduce intake restrictions and increase air velocity for improved performance and less fuel consumption.ÿMade in the USA.